In the days since I first read the article I bought “Making Moves” via Digital Download and the Primetime Players’ newer Entrance Music “Move (Get It In)”. I already have everything else on his list except Angels and With Legs Like That, neither of which I liked personally after listening to them. The above are Johnston’s personal favorites and my list varies only slightly. In all 15 cases–along with nearly everyone else with their own entrance music–the music personifies the Superstar or Diva. The mindblowing thing Johnston revealed in the article is except for Stone Cold Steve Austin and Triple H, wrestler input has little to no impact in the creation of their music. Nine out of ten times, all he has to go off of is in-ring footage to use as a starting point. In the case of Stone Cold the Texas Rattlesnake worked with him to get it just right. Then again you wouldn’t want to turn down a guy who didn’t have a problem dropping his own boss with a Stunner. In the case of Triple H he’s open about his being a fan of Motorhead and requested the collab. All of the songs listed above–my list and Johnston’s–can be found on YouTube but I bought them all because to me they were a bargain: They were part of an album or only sold for a dollar on Amazon’s MP3 Store. When Lesnar, Batista, The Undertaker or Mark Henry’s Music hits you know someone’s about to get crushed. When Stone Cold, The Miz, Alberto Del Rio or Randy Orton’s Music hits the house crowd’s reaction tells you they know they’re about to get what they paid to see. Hands down Jim Johnston has incredible skills. I’m surprised he hasn’t been inducted into the WWE Hall of Fame yet actually. Personally his skills easily match Hans Zimmer and John Williams but that’s just me. My list will be added to My Favorites Page shortly. I will also add my list of Favorite WWE Finishers as well. For those who don’t know, Open Source programs are developed with the intention that the user can use it any way they wish and they are also free to modify the program as they see fit. As a bonus they can they redistribute the modified program as a separate entity. That’s how Libre Office came about. It was developed by people who used Open Office and branched off. And it’s all 100% Legal. Any and all updates are free as well no strings attached and the best part is in the case of Open Office and Libre Office, combined they use far less of your computer’s resources than any one of Microsoft Office’s applications. Microsoft wants consumers to pay $100 a year for MSO2013. That gets you regular updates and you can only install it on up to five machines per license. On top of that if you cancel your subscription you lose everything. They’re also going to release MSO2013 in the traditional format but that’ll cost as much as $400 and without the regular updates the subscription version offers. Again: why pay that much for something someone else lets you do for free? Combine the above programs with Google Docs and you have no reason to do that. Not only that Open Office is 100% compatible with Microsoft’s Skydrive system (Web Version). I found out earlier today when I activated Sky Drive on my Desktop computer. Don’t get the wrong idea I do not work for Open Office or Libre Office. I’ve just been using them for ten years and have come to appreciate the more tranditonal route both programs take. They sacrifice aesthetics for functionality and it shows. From the looks of things Office 2010 will be the last one I ever buy from Microsoft. I just see no reason to justify the price jump personally. More so given the You Tube Video I posted last night. As I announced two months ago I suddenly closed my You Tube Account. This was true. What I didn’t tell you was that wasn’t my only You Tube Account. I have two. The other one I use with my online alias Victor Bravo, which has separate WordPress Blogs as well. Different names but same person and personality. I’m no Violentacres. I don’t play pretend. While it’s true I never talk about what I do with my other internet username here, around this time last year I came clean about the fact Brendan Aurabolt and Victor Bravo are the same person on several websites. As for why I don’t talk about what I do as Victor Bravo, everyone has their vices. The problem–as I spelled out in that video–is unlike most people who use the internet when I record my videos I use my real face and voice. I don’t have the luxury of starting over under a new name. As such, when some folks decided to use my image to make personal attacks against me earlier this week in a series of You Tube videos let’s just say I was very pissed off and responded in kind with the video I did last night. To make a long story short things were resolved and as a direct result of this I am now free to reopen my You Tube Account. Ironic given I originally planned to announce its return on today’s date! As I said in my other blog post I didn’t want to announce when it would return because at the time, deep down I knew it wasn’t over. Now that is is and I’ve put the whole mess behind me I can focus on other things. Like these blogs. And the videos. All 60 of them. I will only update the ones ambiguous to the passage of time. I already planned to redo a few of my earlier ones anyways so…yeah. The upload process begins this weekend. I expect it to take several hours but at the very least I should have 20 videos up by the end of the weekend. I hope that you will continue to support me, read my blogs and once again watch my You Tube Videos. Going into their respective games both teams were the underdogs. Atlanta was favored to win the NFC Title and New England was favored to win the AFC title. The Patriots and the Falcons were swept away in the second half of their respective games. As a Patriots fan I stopped watching haflway through the third quarter. Given Boston teams have a history of blowing big games all I can say is they didn’t want it bad enough. They certainly weren’t playing like it. All I can say is it’s probably better they didn’t make it to the Super Bowl in hindsight. At the end of the day life must go on and fans don’t decide the outcome of games. I consider motivation and good luck two different things personally. It’s also easier to see the Speaker of the House John Boehner in the second picture as well as the two bibles. The bibles belonged to Dr. Martin Luther King Jr. and Arbaham Lincoln respectively. 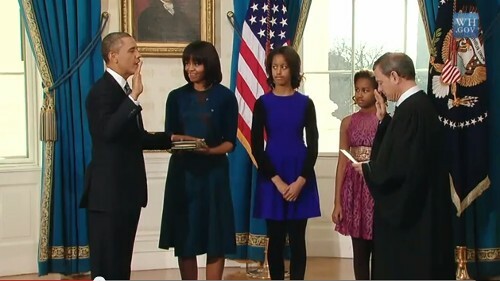 On Sunday the president was sworn in with a bible belonging to Michelle Obama’s family. With the president’s second term now officially underway political pundits are already talking about the 2016 election. In the wake of the 2012 election the Republican Party–held hostage by the Tea Party Movement–may very well be on the verge of collapse. Their 2008 and 2012 choices were poor for different reasons and historically, they’ve gained the reputation of being “The party of NO.” No to Healthcare reform, no to immigration reform, no to common sense. Now don’t get me wrong, I’m just generalizing. I know alot of Republicans with common sense who know how to use said common sense. The problem is the folks they sent to Washington are only listening to the vocal minority. This is also true about the Democratic Party but to a far lesser extent. In terms of who could run in 2016, I’m hoping Herman Caine gives it another shot. In my opinion he would have been the better choice with Paul Ryan at the 2012 Election instead of Mitt Romney. Fortunately the 2012 election proved to him he can never be president no matter how much money he has. Having had to deal with him when he was Governor of Massachusetts I can say that. Sarah Palin’s a sensationalist and the official spokeswoman for the Tea Party Movement that was created right after the 2008 election. They’ve been silent for the last two and a half years now which to me shows their political influence has greatly weakened. If only the same could be said about the NRA but I’ll save that for another blog (LOL). Like the 2012 Election she’ll probably just talk about running but won’t actually go through with it. If not a known person the Republican Party might go with an unknown just to shake things up. As for the Democratic Party, Joe Biden has all but said he’s running in 2016. I wouldn’t be surprised at all if he goes for it depending on how the second term goes. People want her to but it’s very unlikely Hillary Clinton will run again. I just don’t see it happening after spending 16 years in Washington (8 as First Lady, 4 as a Senator and 4 as Secretary of State). If anyone connected to Bill Clinton deserves a break, it’s her. It’s also possible an unkown will throw their hat in the race just to shake things up. By the way in case you missed it Monday was MLK Day. The references were pretty obvious during the coverage of the day’s festivities. As was said to death, 2008 was showing it was possible but 2012 was about showing 2008 wasn’t a “mistake”. I’ll say it now: there is a 25% chance we will see either the first female president/vice president or another person of color become president or vice president in 2016. Going back to Biden, don’t forget I said him running depends on how Obama’s second term fares. After all he is partnered with the president and would be held equally responsible when things go bad. Noticably absent from the 2013 Inauguration were the Bushes (41 and 43). George 41 is recovering from an illness and Bush 43 is presumably with him. Even so I’m surprised a family member wasn’t there to represent them. While the second Bush’s popularity nosedived after Katrina I think he should have been treated with a bit more respect. It’s instances like that, the 2004 election and the 2008 election I will never run for president ever. Mayor of Boston yes but not president. In the interests of not putting anyone in a bind I’ve decided to formally add a disclaimer to all of my WordPress Blogs. It’s set as a separate page and is appriately titled “Disclaimer”. As more and more people find their way to my blog I want to make sure that unless specifically referenced my viewpoints are not affiliated with any groups or organizations I am, used to be or may be affiliated with in the future. For example City Year and Boston Public Schools. Some of viewpoints I’ve expressed in recent postings on all of my blogs would easily be considered off-topic or contradictory with the vision or viewpoints of said organizations. I’ve also got my own political aspirations to be mindful of as well so…yeah. One other thing: I added a few Widgets to all five blogs to make following the blogs and sharing it a bit easier. More so if you have Twitter or Prefer Email updates. Not Facebook because I dom’t care for Facebook but I can tolerate Twitter. This blog now has the highest postcount of any other blog I’ve set up. I’ve finally gotten settled into a good weekly blogging schedule so more posts are to be expected! Who but the Master Surgeon himself could combat the Flu Epidemic that’s hitting the city hard. As of this morning there are 700 people confirmed to have the flu in Boston area (The city has a population of about 4 million) hospitals. As a result of this and 18 Flu-related deaths in Massachusetts (four in Boston), Boston’s Mayor Thomas Menino declared a state of emergency. Speaking for myself I did get vaccinated last week at my annual physical during the winter break and obviously I am now very thankful I decided to get it. Technically it would be inaccurate to say the Flu Vaccine prevents you from getting the Flu. After all there are confirmed cases of people who’ve been vaccinated who’ve contracted the Flu anyway. What it does do is dramatically decrease the possability of your getting it, more so if like me you work in close proximity with alot of people. 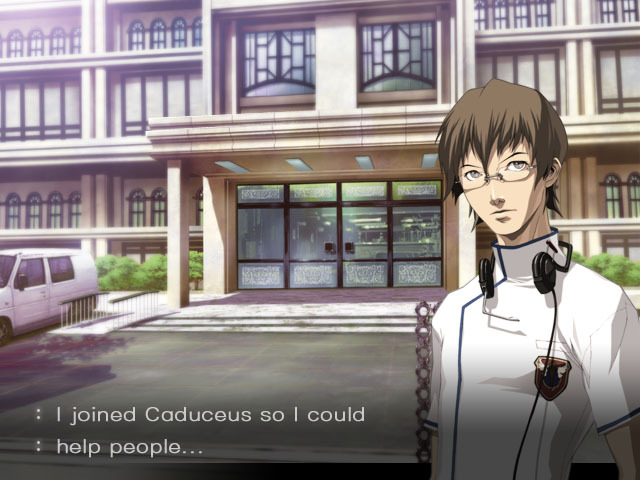 By the way, Derek Stiles is a doctor in the video game series Trauma Center. In the two flagship games Under The Knife and Under The Knife 2 Dr. Stiles combats a biological weapon called G.U.I.L.T (Ganglated Utropin Immuno Latencvy Toxin), which across the two games has ten different strains (7 in the first game, three new kinds introduced in the second) which are all treated on the operating table. Derek uses the Healing a Touch, a Superhuman ability believed to be a blessing (and curse) from Asclepius, the Greek God of Medicine (To Clarify Hippocrates is the Greek God of Doctors and is the namesake of The Hippocratic Oath). The Healing Touch grants Dr. Stiles superhuman concentration, allowing him to perform life-saving procedures that would otherwise be impossible. In two particular operations time itself (the final in each game) time itself stops, allowing Derek to erradicate GUILT once and for all. The reason I mentioned Derek Stiles specifically is because after losing his father at a young age to an incurable disase, he became a doctor to remove the word “incurable” from medical textbooks. Of course Influenza is treatable now but as the strain evolves we’re going to need to step up our game. H1N1 is just one of the known Flue Strains–called Super Bugs by medical experts–that is resistant to antibiotics. This is why if you get sick, do yourself and your workplace or school (if you are a student) a favor and stay home. In going to work/school you are putting others at risk. If you haven’t heard by now you should be in the know within the next 3 hours if not sooner. Here is a link to the article and Video. The video and article speak for themselves and the video itself has gone viral on social media. Piers–and by extension CNN–has a big pair. I don’t have a doubt Piers insisted the interview happen, more so after as he hinted during the interview he’s been accused of shouting down the other side in recent interviews. Hats off to Piers for standing his ground weather you like him or not. Normally when a guest gets that intense on a live interview on any network they stop the interview right there and the guest is escorted from the building. Mr. Jones might have prevented Piers from doing ehat CNN likes to do when they obviously disagree with such a divisive subjective viewpoint (ie. Gun Control vs. Gun Rights) and in doing so “won the battle” but without a doubt, his side “lost the war”. As Piers’ next guest pointed out alot of people share Mr. Jones’ viewpoint. In giving him that large a platform CNN prettymuch exposed the “vocal minority” to the world. I’m calling it first: This interview will be the turning point in the Second Amendment debate. Mr. Jones is delusional. This was made clear by the fact although he came prepared much of his information was only half-right AND he kept changing the subject. He claimed to have agreed to the intervieew to “set the record straight”. He did all that and more. Guns exist for the sole purpose of killing or injuring people and/or animals. Knives have be used for the same purpose historically but never on an industrial scale. America may have been founded by cutthroats, thieves and scallywags but that’s history. See, people keep getting the Second Amendment mixed up with the Third Amendment (The Government can’t seize your home or garrison troops in your home without compensation) and the Fourth Amendment (Law Enforcement can’t search your home without a warrant). There’s a fundamental Difference between the Three Amendments. Any 3rd grade student can tell you about the American Revolution. At the time American Colonials were just above Slaves in terms of social status in the eyes of British soldiers. At the time–notice the stress on those three words–American Colonists were subjects of the British crown but had no say in the governance of domestic affairs. The British Military regularly raided warehouses and seized munitions to subjicate the people (Hence Amendment II). If a British soldier needed a place to stay and picked your home you complied or had your home taken from you (Amendment III). Finallhy, if they felt like it a British soldier could walk into your house and take whatever they wanted whenever they wanted and there was nothing you could do about it (Amendment IV). Bear in mind this was during a period 337 years ago. Thanks to the above Amendments there is ZERO chance of this being repeated EVER. Besides, there are 300 Million Guns we know about in the hands of American citizens alone. Almost one for every American Citizen in the country. That number does NOT include the United States Military, independent licensed armed security companies and all 50 State National Guard programs. Under the command of the state governor, they (The National Guard) are the second line of defense against threats from without and within behind the US Military but can be ordered to mobilize by not just by the governor but mayors as well. Ergo, the idea that American citizens will be “defenseless” is nothing more than a myth. One reality Mr. Jones refused to accept is even among Gun Owners and Gun Rights Activists is there is a growing shift of opinion in the age-old debate. Last night’s interview and Sandy Brook were, without question the turning point. There is no denying that. Even if it doesn’t happen next month or next year there will be new legislation for those who wish to exercise their right to bear arms. I want to end with this: I use my blogs to exercise my right as an American Citizen to Free Speech and Freedom of Expression. If you don’t like it then go read someone else’s blog. No one’s holding a gun to your head forcing you to read what I write. I do not own a gun, nor do I wish to own one. You’d be surprised how many household items can stop bullets–keep The Good Book close to your heart, for example. I mean that literally. Even so I know people who own guns and I respect their right as gun owners to own guns for their own reasons. I know them and I know they exercise common sense. The problem is the fringe minority who own guns just to own guns–like Mr. Jones, for example–makes the sane mjaority look bad. As such, I’d say I have every right to exercise my right to protect myself from idiots obsessed with guns and conspiracy theories. I agree with the saying “Guns don’t kill people, people kill people” but the problem is with these mass shootings, some people like to use Guns to kill ALOT of people simply because they can.